Today, we have firmly positioned ourselves as one of the distinguished High Frequency Induction Brazing Machine Manufacturers and suppliers based in India. Brazing is a process of joining of similar as well as dissimilar metals by utilizing heat and braze materials (filler materials). Our Induction Brazing Machine is manufactured from the optimum quality raw materials as per the national and international quality standards. Induction Brazing Machine offered by us is designed to offer excellent as well as repeatable brazing without smoke and flame. 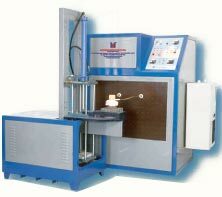 We provide Induction Brazing Machine within the stipulated timeframe at very competitive prices. Brazing is joining of similar or dissimilar metal (parent materials) by using heat and braze material (filler material) whose melting temperture is normally above 450 C and below the melting temperature of parent materials being joined. Microtech induction brazing machines are made to replace conventional brazing methods, with more reliable / repeatable brazing without flame and smoke. Brazing temperature can be controlled from 450 C to 1200 C for most of the brazing applications. Lesser brazing cost comparing to conventional methods.